DESCRIPTION Welcome to the family friendly community of Walden offering the best in suburban living. This dual-master, 3 bedroom total, 2.5 bath Avi townhouse offers an open plan featuring a roomy living room with extra height windows, antique style wide plank wood flooring, spacious dining area & large well laid out kitchen with island. m, play area, laundry with sink, storage & Roughed in bath. The west facing master bedroom easily accomodates a king sized bed, offers 12 foot ceilings, massive windows towards the Rocky Mountains, wide plank wood flooring, large walk-in closet & full bath. The rear master is even larger & has a bathtub/shower & a walk-in closet. Finished basement with 3rd bedroom, rec room, laundry with sink, storage and roughed in bathroom. With a fully fenced yard with grass area and detached double garage, this home is pet-friendly! Located steps away from transit, parks & major shopping. Don't miss out on this exceptional opportunity that you can call home. Home for sale at 210 Walden Ga Se Calgary, Alberts T2X 0P3. 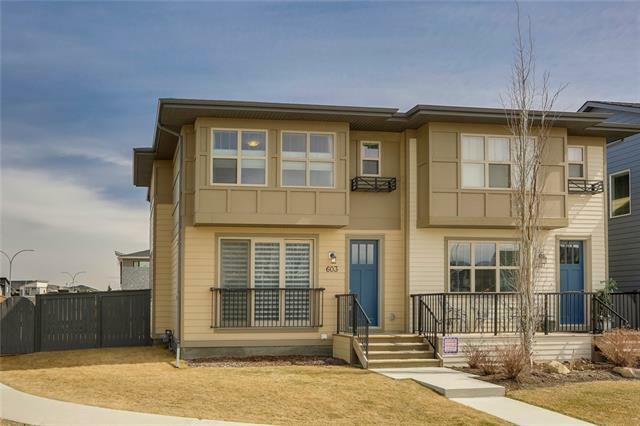 Description: The home at 210 Walden Ga Se Calgary, Alberta T2X 0P3 with the MLS® Number C4222397 is currently listed at $315,000.